This is a topic that I have felt the need to share for several seasons—How do the skiers we all admire—high level racers, national demo team level instructors, top bump competitors and high level free skiers—get to the level they are at? If the average skier wishes to maximize their own performance levels within the confines of fixed variables like snow time and terrain available, what should they do? This is not so much a statement of fact, but rather my observations over more than a decade of transforming my skiing, learning how to coach and [I like to think] being a general student of the sport while having the privilege to spend time around and be helped by some top minds from around the industry. In a recent conversation, a colleague proposed three paths a skier can take when looking to improve… I thought this was an insightful and simple way to segment skiers who wish to improve. I’d like to elaborate on the third option, more specifically—what does it take to not only be successful at rebuilding your skiing from the snow up, but what does it take to ski like the skiers you most admire—to continue to progress once you have adopted a [new] skiing model. What type of approach does it take to reach the highest end of expert status? This could be top level demo skiers, FIS/WC skiers and other professional skiers of various disciplines—organization, dogma and national association agnostic. This is a combination of my own experience, and learnings from top coaches and athletes who are, or have been at elite levels… Certainly not gospel, but representative of the commonalities shared by those who have gotten to and stayed at very high levels of performance. It can also give perspective as we compare with our own efforts to improve—are we really as committed as we claim? Have a target technical framework or skiing model that serves as a target-state and base to build on. This ensures that you know where you are going. Knowing what ‘good’ consists of in the context of your chosen model, the ability to describe it, know it when you see it and when you don’t is very important. A skier not fitting into ‘your model’ does not make them a bad skier, simply that their technical approach is not aligned with your own—it is a choice. Challenging 'what you know' is always a good thing, however do not let it become a distraction—meaning input from too many sources leads to confusion. The model should be simple, clear and concise. When it comes time to change one’s technical model, or base technique, it is not an easy process—often taking several seasons (even if doing 100-day seasons) of focused practice to truly leave behind the old and bring in the new. Take ownership of your improvement. If you aren’t willing to self-coach, you’re not going to get there. You have to be your own coach—taking ownership of linking fact-based movement analysis with both internal and external cues. Have an honest view of your ability, track your progress, opportunities for improvement and the challenges/roadblocks that are holding you back or standing in your way. You must be able to recognize opinions/directions that will not land you at your desired outcome and not let these become distractions to your goals. Always be aware of where you are on your path to improvement and be honest about whether you are making progress or not. If the answer is ‘not’ you must recognize the need to change something. Have no ‘sacred cows’—technical models, coaches, equipment, terrain, etc. Lastly, taking ownership of one’s improvement would be incomplete without the mention of deep, targeted/focused practice (see The Talent Code). Select a coach/mentor who shares your vision but does not dictate it—someone to keep you pointed in the right direction. Keep the right people around you that will ensure that you are progressing toward your goals. Ensure that the feedback is constructive—not destructive and not cheer-leading. Do not waste your time with a coach who is not aligned with your vision—your target, goals, ideal model—too much outside input can be distracting, or worse, derail you from your goals due to being pulled in conflicting directions. Maintain a relationship with the same coach for the long-term—try not to change coaches weekly, monthly, yearly… Even if touch points are less frequent, if the relationship works, they can be very valuable to your journey. Digging slightly deeper on item 1 above (Have a target technical framework or skiing model): Many are left wondering—what exactly does this mean? Coaches and instructors often talk about technique, but is there really a firm grasp on what having a technical model truly implies? The answer is that a technical model should describe the basic movements that a skier is making to create and complete a turn. If the model is not thought-out well enough to describe the movements, it should at minimum provide a visual of what good looks like—e.g. zipper line bump skiing, slalom skiing, etc. Going a step further, there are fundamental movements within the skiing world that differentiate various approaches to making turns. The attributes of a technical model should outline and display specific, easy to describe, and easy to observe and measure movement patterns as a way to benchmark a skier’s performance and improvement. Understanding how these movements combine to create turns is the basic foundation of the ability to perform movement analysis. Whether a skier subscribes to a particular model or not… whether they even know it or not… or admit it or not—every skier has a basic set of fundamental movements that they default to when making turns. Below I pose a direct question that should be able to be answered by a well-defined technical model, followed by a more specific description of what a coach might be observing in each instance. This is also a strong base from which to perform Movement Analysis. How is the ski engaged in the turn? Is the ski tipped or twisted into the turn? If the ski is tipped onto edge, how is the ski edged—foot tipping, upper body leaning, hip angulation, knee angulation, a combination of all… etc. If tipping is used, does the edge angle continue to increase/decrease throughout the turn—e.g. the ski is always increasing or decreasing angle, but never at the same angle for a length of time? If the ski is twisted onto edge—what powered the rotation, etc.? Where/when does the ski engage in the turn? Does the ski engage before, at or after the fall line? How is the ski released from the turn? How does the skier make the skis go back to flat, e.g. equal leg lengths? Does the skier extend to initiate the release? Does the skier flex to initiate the release? Which leg/ski causes the release? Where/when is the ski released from the turn? Where in the turn does the movement that creates the release begin—e.g. where does the ski begin to de-edge? What does the skier do to balance against the ski/skis? If yes, is it appropriate for the turn the skier is attempting to make? What part of their body is doing the countering? If other parts were used, could the skier improve ski performance? Is the skier balanced against primarily one ski or primarily two skis? Is the skier’s base of support one or two skis? Why is this the case—e.g. can the skier make changes to how they are moving on the skis that will change how they are balancing on the skis? What does the skiers body do in relation to the path of the skis? Does the skier follow their skis? Does the skier counter their skis? Is the countering movement appropriate for the turn? What part of the body is the countering movement coming from? What is the main mechanism for turning the skis? Simple: tipping or rotation… does the skier turn the skis or do the skis turn the skier? How does the skier manage their fore/aft relationship over the skis? How does the skier use flexing/extending to maintain fore/aft balance? How does the skier re-center between turns? Where is the skier forward, where is the skier aft? 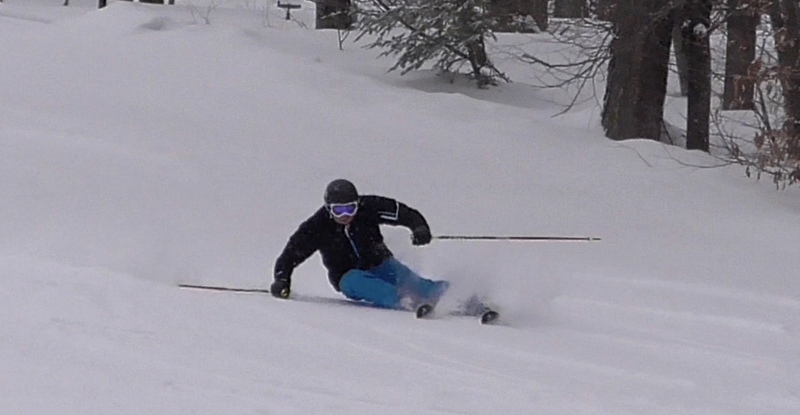 Is the skier forward during the turn or transition? What are the skis doing when the skier is most forward? When are the skis being used the most compared with when the skier is most forward? When in the turn are the skier’s leg’s extended? When are they flexed? Are the legs long in the turn or long in transition? What does this indicate about how and when the skier releases the ski? What are the skis doing when the skier is flexed versus extended? How much flexing and extending is the skier using? Could more or less be advantageous? Where (in terms of skier’s body) is the differentiation between upper and lower body? Is there a differentiation? Where does separation occur? Pelvis? Rib cage? Is the hip part of the upper body or lower body? How are the arms/poles/shoulders used? Is there rotation present with the arms/poles/shoulders? What is the result of the rotation—e.g. what is the skier using it for, if anything? A well laid-out technical model would be able to answer each of those questions with a definitive answer—“this is how you should be doing it” and going a step further should be able to point out in a sample turn, where each answer is displayed in the skiing. Probably the most well-thought-out, clear, concise and universally applicable technical models is Harald Harb’s Primary Movements Teaching System (PMTS). That said, ask any FIS coach who is worth their weight from big programs around the world and you will likely get descriptions and visuals of the model turn that they have their athletes work toward (if you can get them to tell you, as they aren't forthcoming with this information in such a competitive environment). The racing models I've been able to glean from a few programs actually align well to the PMTS model (hence why I sing its praises). Lastly, if racing isn't your interest, I believe most national instruction organizations have a fairly identifiable style that they teach, however not all align well to teaching racers. Unfortunately, North American instruction systems (especially PSIA) tend to have a very undefined approach. However, if you look at any of the Asian national organizations and many of the European national organizations you'll see very strong, consistent models for turns. Below is an ideal target state that would be a good model for racers and aspiring expert free skiers to follow (See Harald Harb’s Essentials of Skiing for more detail). How are the arms/poles/shoulders/upper body used? What I like to look at, is how top-level racers ski when training. Training is often cleaner and not as fast, but it lets us see how the racer skis in an ideal setting—when perhaps the clock is not to main focus of the run. I don't like using top racers' free skiing as a model usually... because most WC skiers when outside of a course are skiing maybe at 50% or less of their capability... I'm more interested in how the skier reacts at ~85% in an obvious training setting, but not such a high-stress, high risk/reward environment as a WC race. Below are a few training runs that fit well into the technical model I outlined above. Now view some common instruction models… Which skiers employ similar movement patterns to the racers above? Taking into consideration the differences in movement patterns among technical models, it is all-the-more apparent that when choosing a technical model for racers to follow, the proper set of fundamental movements is taught or all that snow time is spent incorporating movements that will not allow the racer to ski like the best and ultimately will not work in the course. Viewed 8734 times ( | Print ) this page.